Partial eclipse occurs when the Sun and Moon are not exactly in line with the Earth and the Moon only partially obscures the Sun. Partial solar eclipse phenomenon can usually be seen from a large part of the Earth outside of the track of an annular or total eclipse. Some eclipses can only be seen as a partial eclipse, because the umbra passes above the Earth's polar regions and never intersects the Earth's surface. Partial eclipses (and partial stages of other eclipses) can be observed if one is viewing the sun through a darkening filter (which should always be used for safety). 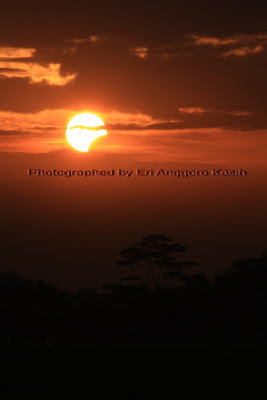 Partial solar eclipse photographed using Canon EOS 1000D. Camera's setting when capturing partial solar eclipse in Tasikmalaya on November 3rd, 2013 : FL 250.0 mm ƒ/22.0 speed 1/15 ISO 100 Flash (off, did not fire). For your safety, always using solar filter mounted on your camera or using live view when capturing partial solar eclipse. thank you for your information, it's very useful to improve my blog. in my browser, all picture loading correctly, would you like to send my by email the wrong display ?